After installing Skype in your system , you may need to have it in tray icons or in message applications. So for adding it in message applications first of all try to find ".desktop" file. In my system , it returned me : "['pidgin.desktop']" . because I installed pidgin. It maybe returns you different values because you may installed other message applications. $ gsettings set com.canonical.indicator.messages applications "['pidgin.desktop','skype.desktop']"
Note: be careful you should add all of values + "skype.desktop" like I did above. 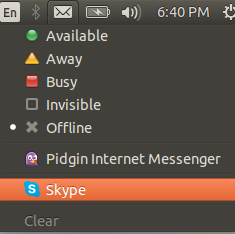 I had "pidgin.desktop" + new application "skype.dekstop"